We think there may be a misconception about Ice Age life; people seem to assume that all the politics and drama of modern day didn’t exist just because there wasn’t a highly developed language….wrong! Our resident archaeologists have studied dozens of cave paintings and have concluded that, in fact, even in the time of dinosaurs, some folks had it, and some didn’t. Cave people had cliques, cave people had A-list celebs (and their version of the paparazzi), cave people had “who wore it best” sections of their cave drawings. 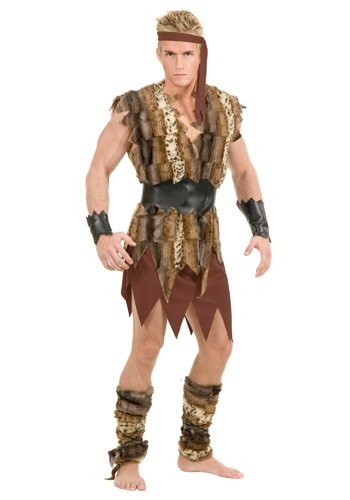 So, when you dress up like an early hominid this Halloween, take a moment to think: do you want to be a caveman (yawn)? Or do you want to be a COOL caveman? There is a difference! The subtleties may escape the modern layperson, but you will show your inner elan when you wear this Cool Caveman Costume out on the town! This ensemble includes tunic, skirt, wrist cuffs, ankle wraps, belt and headband. But the difference is in the details, like the slouchiness of the ankle wraps, the tightness of the faux-leather belt (interestingly, faux-leather was the preferred fabric of cave celebs), and the specific arrangement of animal prints on the tunic that set it apart.Those other dudes may be real Neanderthals, but you can be THE MAN of the cave in this look! Finish it off with moccasins and a club, stone axe, or spear, then prepare for a flurry of flashbulbs and autograph requests.